Q. In our men's bible study we have some people that are members of Brethren (think Darby, Chapman, Mueller) church bodies, and they hold a somewhat bizarre theory that there was a gap of time between Genesis 1:1 and Genesis 1:2. They refer to a group of scripture passages that they believe bolsters this idea. But I think most readers would associate the events of these passages with the flood of Noah rather than some pre-Adamic creation event. I have spent some time looking into this concept and it seems that there are a very large number of people in dispensationalist camps that do hold to this idea, among them, Scofield, Larkin, Darby, Watchman Nee, George Mueller, and many many others and even some today like Les Feldick who seems to be among the hyper-dispensationalist camp. Personally I see no reason for it then or now, what do you think? Was this just a fad that primarily swept through the camps of dispensationalist thought in the mid to late 1800’s or is it still subscribed to? Do you have any insight as to how widespread this thought is? Are there well known names of dispensationalists that don't subscribe to this gap between verses 1 and 2 in Genesis 1? The endorsement of the idea by Scofield's notes is probably one reason why the idea came to be adopted more widely in dispensational circles. However, there is nothing about the idea which is inherently dispensational—the main motivation generally being a desire to reconcile Genesis history with long-age uniformitarian geology, something which has tempted interpreters of every theological persuasion. The theory was further promoted by the publication in 1970 of Arthur C. Custance's book, Without form and Void . I sympathize with your observations. I do not subscribe to the various ruin/reconstruction versions of the theory for numerous reasons. For one, I don't think the passages which proponents appeal to in support of the scheme "clearly indicate" (despite Scofield above) that they have Genesis 1:1-2 in view. Moreover, Pember and many others attempt to place the fossil record therein, but a straight-forward reading of Genesis doesn't make room for death before the fall nor "pre-Adamic beings" or other far-fetched ideas. To be fair, not all gap theory advocates appeal to the same passages as Scofield's notes or attempt to shoe-horn the fossil record or early hominids into the gap. There is a "literary gap" view and a "young earth creation/chaos/restoration view" (à la Fruchtenbaum) neither of which insert a long time period between verses 1 and 2, but which still attribute the conditions of verse 2 to a judgment associated with the fall of Satan and his angels. It seems likely that the idea may have even arisen earlier, in association with the fall of Satan, quite apart from any desire to reconcile uniformitarian geology or the notion of an old earth with the Genesis account—although this most certainly is a motive for many who adopt the "old earth" view. 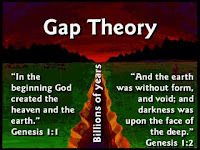 Although it has been popular in dispensational circles, the gap theory is an egg which was not hatched by dispensationalism and has no dependence upon dispensational distinctives. 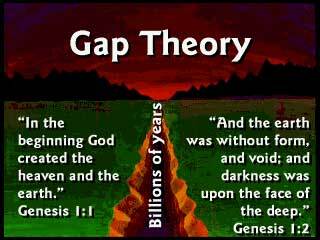 However, as you observe, many mainstream dispensationalists still subscribe to some form of "gap" between Genesis 1:1 and 1:2, although not all allow geologic time or fossils (evidence of death) to intervene. Some merely see it as a literary gap (verse 1 providing the overview and verses 2-31 providing the details). I am not very familiar concerning the views of various dispensational teachers in relation to the gap theory—mainly because I've never found the idea very convincing. However, in the limited time I had available, I did find the following “better known dispensationalists” of today who don't subscribe to the gap theory: Charles Ryrie (see the Ryrie Study Bible ), Arnold Fruchtenbaum , and Robert Lightner. I am unsure about other familiar dispensational names such as John Walvoord, Dwight Pentecost, Charles Swindoll, and others. C. I. Scofield, 1917 Scofield Reference Bible Notes (n.p. : 1843-1921), Genesis 1:2. Weston Fields, Unformed and Unfilled (Collinsville, IL: Burgener Enterprises, 1976), 36. Arnold Fruchtenbaum, Ariel's Bible Commentary: The Book of Genesis (San Antonio, TX: Ariel Ministries, 2008), Genesis 1:2. Although Fruchtenbaum views the conditions of Genesis 1:2 to be the result of a judgment brought about by the fall of Satan, he doesn't allow geologic time or fossils to be inserted between verses 1 and 2.